Born in Vancouver, B.C. Kit attended the University of British Columbia, graduating with a Bachelor of Science in 1974. Throughout her life Kit has always drawn and painted and although her professional career took her into the world of computers, art always remained a strong interest. 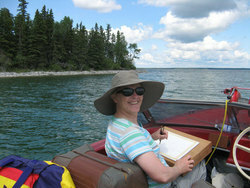 Kit moved to Ottawa, Ontario after graduating from UBC where she began to paint landscapes in oils. She was represented by the Inspiration Art Gallery in Ottawa and by the Firehall Gallery in Perth, Ontario. She took the opportunity to study at the Ottawa School of Art and exhibited her work at the BCAL Clothesline Fair in Ottawa (a juried show) for several years. Returning a few years ago to painting, Kit has picked up where she left off. Continuing to expand her knowledge and develop her technique and vision, she enjoys both painting on location and working in her studio.